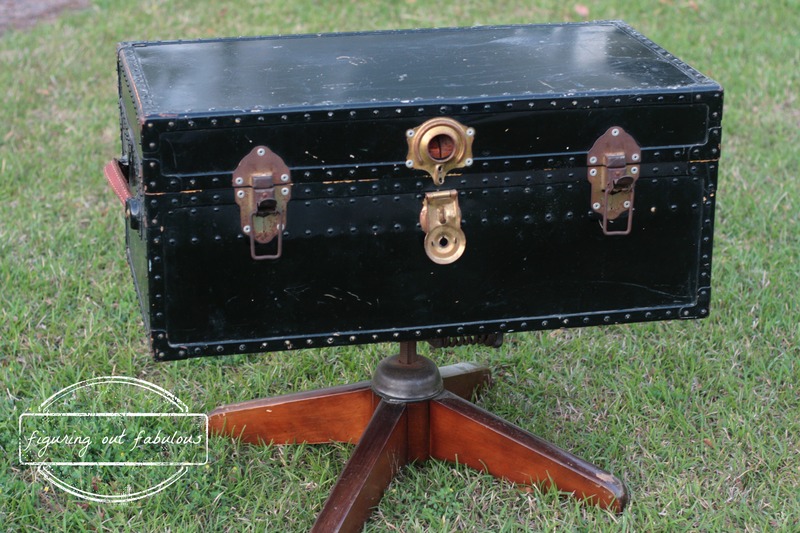 I bought this metal trunk at a yard sale sometime last summer. I paired it pretty quickly with the base of an old desk chair that I found out on the curb. But it sat in the garage unfinished for a long time, because I thought I would paint it to try to cover up some of the scratches and I never felt like tackling that or figuring out how I would do it. It also sat kind of crooked. The top of the base of the chair was slanted, which made the trunk sit slanted. 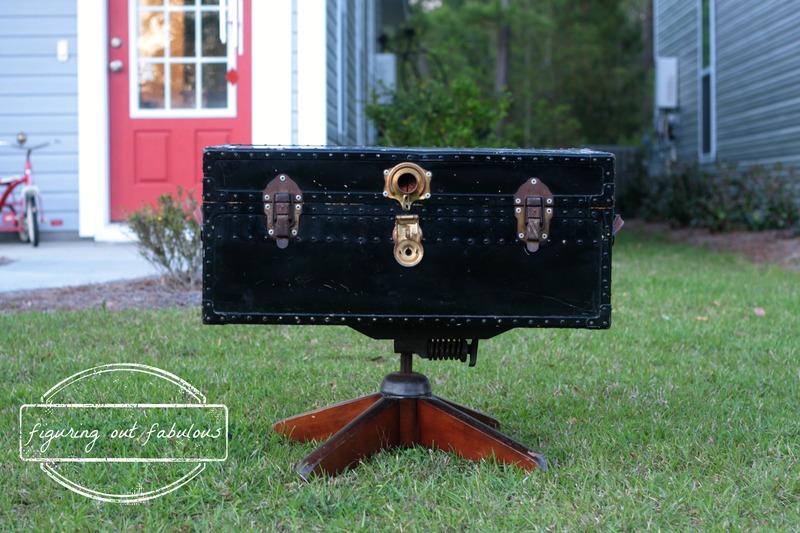 Today I finally decided that I would just leave the scratches and let the trunk have some patina and character. So I screwed a bolt between the top of the table base and the bottom of the trunk on one side to fix the slant. 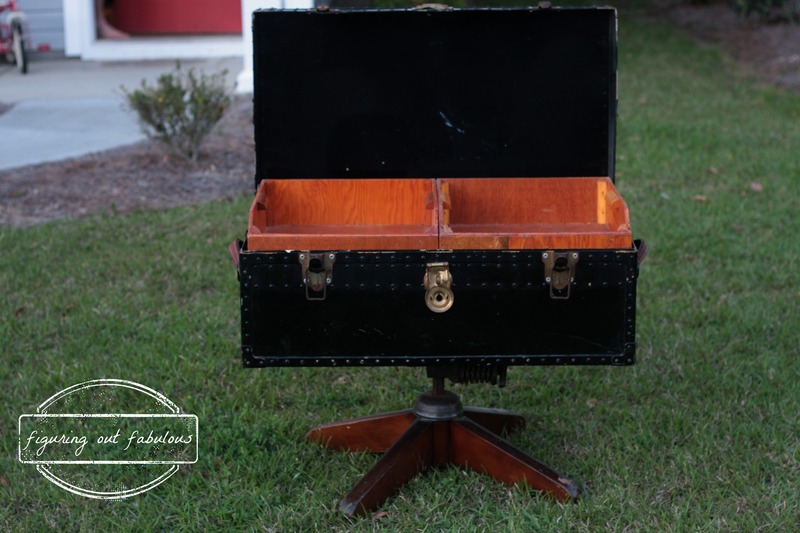 I love that the trunk even has heavy wooden trays inside that you can use for storage and organization. If you’re still reading then you get to learn about a new little trick I learned. 🙂 In my last post I was saying how I wanted to find a clear oil-like top coat that would be easy to rub on my painted pieces. (Danish Oil is too dark for light pieces and poly yellows on light pieces.) Today I tried Howard Feed-n-Wax, which is made with beeswax and orange oil. It’s made for plain wood, but worked nice on my gray painted dresser. I put on a light coat and it added a little color, but not much and dried with a nice smooth feel. It also smells pretty good! Once it dried, I could tell the paint was a bit harder and didn’t get scratched anymore when I ran my fingernail along the top. I got mine at Home Depot, but you can also get it on Amazon for just under $8.